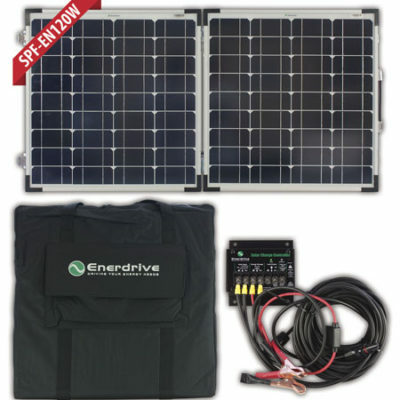 The Enerdrive ePRO Combi Inverter Charger. All-in-one combination of a DC to AC true sinewave inverter, an advanced multi-stage battery charger with a high speed AC transfer switch. The ePRO Inverter Charger has all this built into one compact, yet installer friendly enclosure. Besides these three main functions, there are several unique features offered as well. Some of which benefit from the strong interaction between the three main functions. The main task of the ePRO Combi Inverter Charger is to act as an uninterruptible AC power supply (UPS). In case of a grid/generator failure or disconnection, the ePRO Combi immediately stops charging the battery, releases the AC transfer switch and activates the inverter which takes over the supply to the connected loads. All this is achieved so fast, that even very critical loads like computers will continue to operate without any problems. In case the grid/generator is reconnected again and the voltage and frequency are within acceptable limits, the ePRO Combi activates the AC transfer switch and battery charger again, while deactivating the inverter. The connected loads are now supplied again by the grid/generator without any interruption. Available in 12v, 24v or 48v models and ranging in sizes from 1600-3500w inverter output and 35-120A charger output, the ePRO Combi has a unit to suit nearly any application. AC Input Power Boost, which temporarily assists weak AC input sources when the connected load needs more power than available from the grid or generator. AC Input Current Limit, which limits the maximum current consumed from the AC input source by the ePRO Combi. This limit is user adjustable. Power Factor Corrected AC Input, which optimizes energy efficiency and makes sure that the maximum amount of charging current is available from your AC source. Intelligent 4-stage charge programs, user programmable to fit any battery type. Fully programmable inverter, transfer switch and battery charger parameters, using the Dashboard for Windows software. Programmable alarm relay, for optimal control of external devices like generator starting or selective load disconnection. Freely assignable trigger input, which allows the user to control the ePRO Combi by external events. Temperature controlled fans, to guarantee silent operation under less than full load conditions. Temperature compensated battery charging, using the standard supplied battery temperature sensor for maximum battery lifetimes. AC Input Power Boost – The ePRO Combi is capable of temporarily assisting weak AC input sources when more power is needed than available (i.e. from small generators). This is beneficial when larger loads than both the generator or the inverter on their own could support; so let the ePRO Combi combine both of the AC sources for maximum load support capability. AC Input Current Limit – For those times when you have limited AC supply (i.e. portable generators), you can set the ePRO Combi to only charge at a maximum rate. Alarm Output Relays – Providing full configuration options for the alarm contacts PLUS convert external trigger commands into a number of ePRO Combi status changes. Also available on the larger 2000-3500w Combi’s are two fully configurable 16A 230v alarm relay outputs for controlling large AC loads like air conditioning. Along with two unique trigger inputs, it gives the end user virtually unparalleled control of their Enerdrive ePRO “Power Station”. The Universal Remote Control (URC) can be used to remotely readout all available parameters from your ePRO inverter/charger Combi, like charging current, output voltage, charge stage etc. It is also possible to put the Combi in standby mode or to wake it up again, besides being able to control the maximum charge current and the maximum AC input current. All information is shown on a clear white backlit graphical display. This kit comes with mounting screws and a 3 meter interface cable (standard cat5 patch cable). The URC automatically recognizes to which type of equipment it is connected. Recreational vehicles – With a very small size footprint for power output, the ePRO Combi is the perfect solution for tight installations. Solar Power Systems – Suitable for small back up sites that require variable control capabilities with the innovative Trigger Switches. Industrial Systems – Any small commercial application can be configured to use the ePRO Combi as a smart UPS system again using the Trigger Switches. Commercial work vehicles – Provide ultra clean AC power for sensitive equipment. Marine Systems – Great charging capabilities from a small unit. Add virtually unlimited control to your power system. The Trigger-action feature enables you to assign certain events (triggers) to user defined actions. You can for example configure the ePRO Combi to perform an action when a certain voltage, current or temperature level is reached, or perform an action when an external switch is closed or opened. This offers great flexibility and may in some cases avoid the need to invest in additional external hardware. Turn the AC Input boost function on or off depending on generator or mains supply (recommended so that the smart boost function does not run while connected to mains AC). *Programming kit required for setup of triggers; or speak to Enerdrive at time of ordering. Standards Complies with IEC 60335-2-29 including Australian deviations. Undervoltage limit is dynamic. This limit decreases with increasing load to compensate the voltage drop across cables and connections. Measured at nominal input voltage and 25°C. At high ambient temperatures, maximum output current shall be reduced automatically.